Japanese Officials Declare 'Cold Shutdown' Of Crippled Reactors : The Two-Way If correct, it's an important milestone in the long effort toward recovery from the nuclear disaster triggered by a March 11 earthquake and tsunami. But skeptics fear the government's claim is premature. 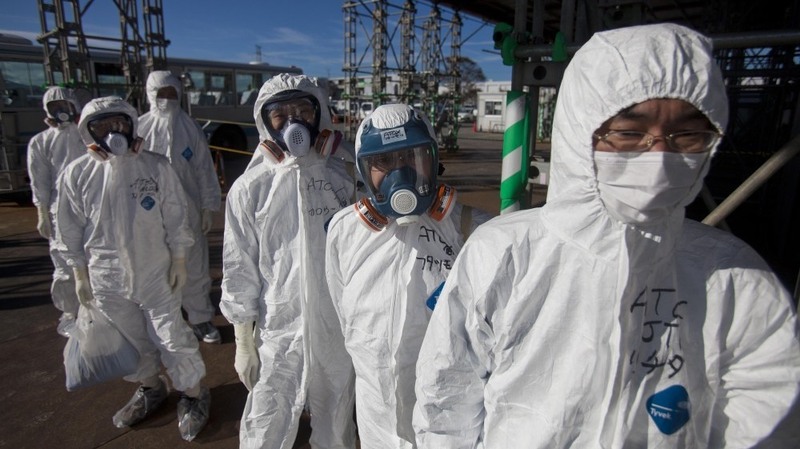 Workers in protective suits and masks wait to enter the emergency operation center at the crippled Fukushima Dai-ichi nuclear power station on Nov. 12, 2011. Nuclear reactors crippled in Japan's March 11 earthquake and tsunami are now in a "cold shutdown," Prime Minister Yoshihiko Noda announced today. If that is correct, it's a milestone on the long road toward recovery from the world's worst nuclear crisis since Chernobyl, The Associated Press writes. The earthquake and tsunami, which left more than 15,800 people dead and nearly 3,500 officially classified as missing, devastated the Fukushima Dai-ichi nuclear power plant and for weeks had the world anxiously watching as engineers struggled to avert catastrophe. A cold shutdown, AP says, "normally means a nuclear reactor's coolant system is at atmospheric pressure and the its reactor core is at a temperature below 212 degrees Fahrenheit (100 degrees Celsius), making it impossible for a chain reaction to take place." "But many skeptics," The Japan Times reports, "believe the declaration is little more than political grandstanding, given the revised definition of what constitutes cold shutdown, and are concerned about the long-term stability of the critical coolant system. ... Reactors 1, 2 and 3 have been damaged and much of the melted fuel is believed to have penetrated through the pressure vessels and fallen to the bottom of the outer containment vessels. Tepco [which operates the plant] has been unable to take direct measurements of the temperatures at the bottoms of the containment vessels." And regardless, as the BBC reports, "the government says it will take decades to dismantle it completely. The six-reactor Fukushima Daiichi nuclear plant was badly damaged by the 11 March earthquake and tsunami. Blasts occurred at four of the reactors after waves knocked out vital cooling systems."